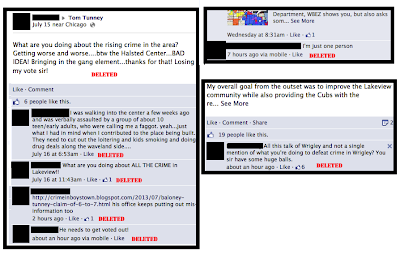 Try as they might, Alderman Tom Tunney's office staff can't seem to stay on top of the negative comments about crime that people are posting to the alderman's Facebook page. We absolutely believe that the alderman has every right to delete posts and comments from his Facebook page whenever he wants. It's his page. We just wonder if it might be more productive, more effective, and more befitting of a leader to simply address the problem at hand rather than try to make it disappear from Facebook. What are you doing about the rising crime in the area? 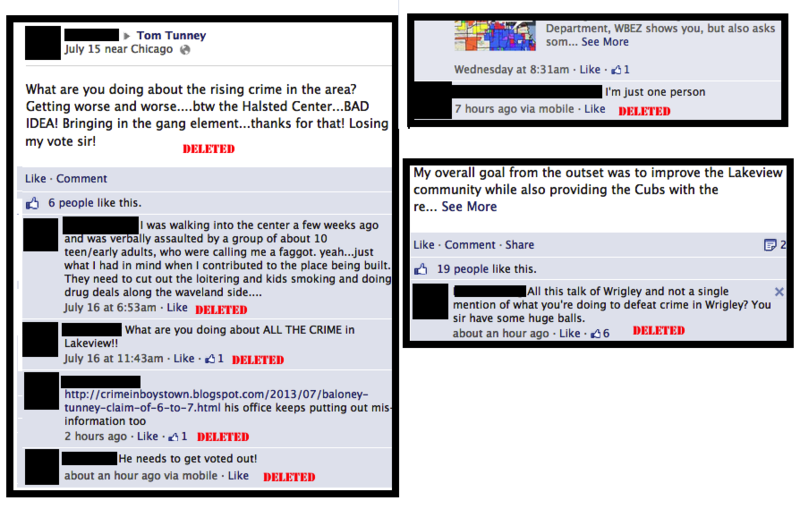 Getting worse and worse….btw the Halsted Center…BAD IDEA! Bringing in the gang element….thanks for that! Losing my vote sir! That post drew at least six "likes" before it and all of its follow-up comments disappeared. Now, if only making the crime problem go away were as easy as clicking the "remove" button. We would definitely "Like" that.